Hello and welcome to the Sparkle Creations Rubber Stamps October Release! The entire team is showing you the last image, Sledding Chloe! To celebrate the release of 6 new images, we are having a hop. Sparkle is giving away 3 of the new images (Caroling Josh, Elf Oliver and Christmas Tree Ruby). In order to win, you need to comment on every stop on the hop because you never know where the prize is hidden! You have 24 hours to comment and the winners will be announced on Sunday. Good luck!! I colored Sledding Chloe with Copic markers and paired her with some paper from Cosmo Cricket Mitten Weather. I added a punched snowflake border (plus some clear rhinestones in the center of them and also for the "o" in the sentiment, "Let it snow"). To finish it off, I added some stitching and tied some baker's twine around with a couple of jingle bells. Accessories: Snowfall border punch, Red baker's twine (Martha Stewart), Markers (Copic), Rhinestones (Pizazz Aplenty), Jingle bells, Foam tape, Thread, Sewing machine. Very pretty!!! love the colors..and the snowflake border. Just darling! I love red and blue together! So darling Stephanie! Love all the little details, especially the tiny bells. Love the colors of the card. I can't wait to place my order. Your card is beautiful, but I think my favorite part is the jingle bells. What a fun idea. So sweet! I love the blue and red, plus the jingly bells are such a perfect touch! Too cute with the bells, love the colors too! Super cute.. just came across this blog and these cute images..
pretty card! simply, but I really like it! great job! OH my goodness, I love this with the plaid and the little bells. Very sweet! The idea to add jingle bells is great.Love the snowflake border ,too. Love your colour choices - and those little bells are perfect! Loving that plaid in your dp....and the snowflake border is wonderful (never seen that one) Tfs your lovely creation. This is so cute. I love the border punch. Super cute Stephanie! 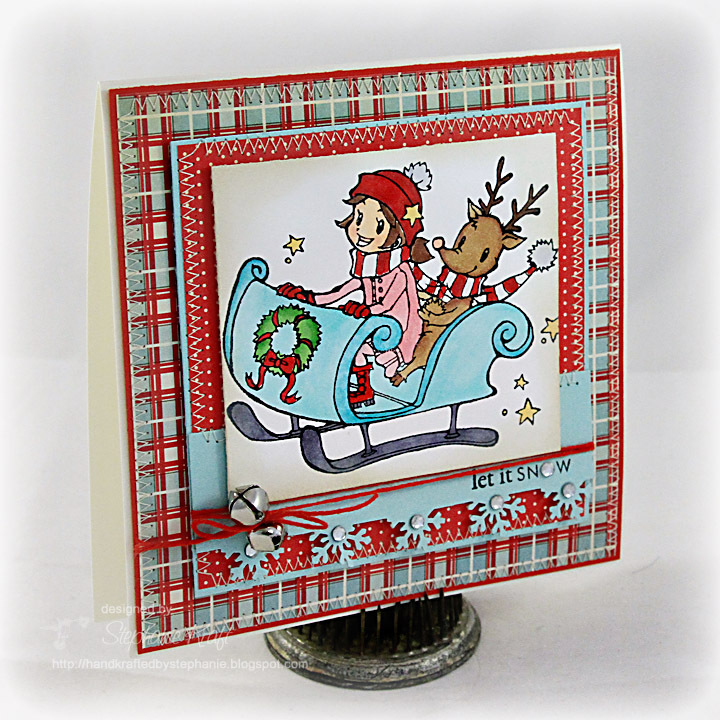 Love all the layers & addition of the little jingle bells! super cute!! love the paper! Just lovely. Fab color combo & layout. Very cute! I love the snowflake border and the bling! What a great color combo ! Love the card ! I really like this card...from the colors to the bells. It's very festive! Super charming Stephanie!! I LOVE these colors, your fabulous sewing, and those sweet little jingle bells!! You chose the perfect paper for such an adorable image. This is such a great card Stephanie! I love the plaid background, the stitching, the cute (and beautifully colored) image, and the snowflake punched border! The little jingle bells are an awesome finishing touch too! Totally awesome card, Stepahnie! Love the bell!